What is early literacy? Early literacy is everything children know about communication, language, reading and writing before they can actually read and write. Research shows that children get ready to read years before they start school, even from birth. The development of early literacy skills through early experiences with language, books and stories is critically linked to a child’s success in learning to read. Take every chance you have to read with your children, tell and talk about stories, say nursery rhymes and sing songs. Early literacy is not the teaching of reading. Your child will learn how to read in school. The most important thing you can do to foster early literacy is to provide an atmosphere that’s fun, verbal and stimulating. When you read, talk and play with your child, you’re stimulating the growth of your child’s brain and building the connections that will become the building blocks for reading. 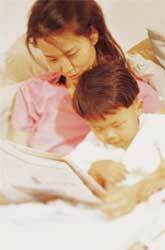 How can you help your child on their early literacy journey to get ready to read? Read: Reading together is the single most important way to help children get ready to read. You’re never too old to enjoy listening to a good book. Talk: Talking with children is one of the best ways to help them learn new words and information. It also keeps families more connected. Sing: Songs are a natural way for children to learn about and play with language. No worries if your voice is not rock star perfect – if you can talk, you can sing! Your child’s favorite voice is yours. Write: Writing and reading go together and help children learn that written words stand for spoken language. Scribbling and drawing are forms of writing too and have meaning to your child. Play: Playing is one of the primary ways young children learn about how the world works. It also helps them learn language and think symbolically – “this box is a rocket ship”. Sing along with EPL staff as they present some favorite nursery rhymes and songs. Click here for the video link. Click here for a print copy of our nursery rhyme sheet – Oh Baby, Have We Got Rhymes to Share! To assist parents and caregivers in helping their children develop pre-reading skills, the Kids’ Library now has Literacy Kits available for checkout. These kits contain books, puzzles, games and/or a puppet to help reinforce the above skills and basic concepts such as the alphabet, opposites, matching, etc.